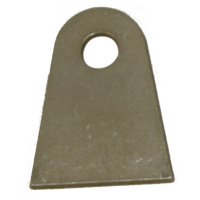 The M-149-T1 coil mount tab is made from .125" 4130 steel. The flat tab has a 1/4" hole, and the center is 1" from the bottom. The tab base width is 7/8" and height is 1 3/8". You can find an image and drawing on the web under the menu free, www.mckinneycorp.com.